DOWNTOWN — It's supposed to be fall. So why aren't the leaves all red and gold? Well, they are changing. Slowly. Fall leaf colors don't peak until mid-October and early November for Chicago and the rest of northern Illinois, according to the National Weather Service. 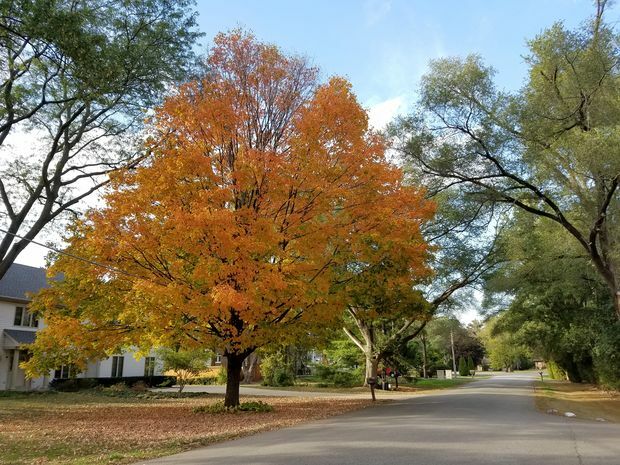 But trees do start to change color in late September (so you might be able to find a few bright spots around the neighborhood if you're feeling antsy). 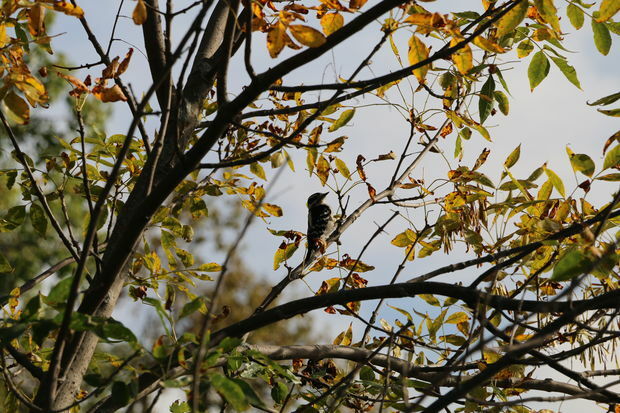 Poison ivy and sumac go first, according to the University of Illinois extension office, and weeping willow and larch leaves will be among the last to transform in November. The change happens not so much because of the weather as because of the changing of the seasons. Fall sees the days grow shorter, meaning there's less sunlight, and leaves aren't able to produce as much chlorophyll to stay green and healthy, according to the extension office. The lower temperatures also can help break down chlorophyll in the leaves. What should you expect once the leaves do change in a big way? Well, Illinois' leaves are predominantly yellow and red, according to travel blog TripSavvy. You might see a purple-red color in dogwoods, red and russet in oak tree leaves and golden and bronze hues from hickories, among other colors. 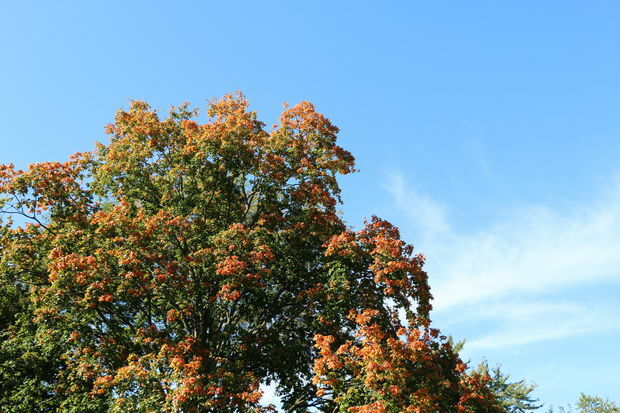 This year, the leaves might be even more dazzling than usual: The most brilliant colors come when there are warm, sunny days, light winds and cooler nights, said Kevin Donofrio, a National Weather Service meteorologist. That's how the weather was earlier this fall, Donofrio said, and it showed in the leaves that already have transformed for the season. "We were having really nice color then, at least for the leaves that were changing then," Donofrio said. "Those days where you have sunny days and cool nights really promote really good color." That weather seems to be sticking around, as the days have been warmer. 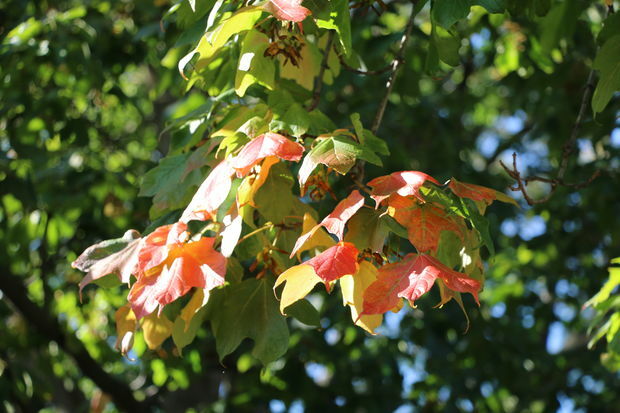 No hard frosts — which can make leaves turn dark brown or black and fall — are expected soon, Donofrio said. And moisture can "mute" colors, Donofrio said, which means there's at least one benefit to the unusually dry, rain-free weeks Chicago has had lately: The leaves might end up being prettier. "Some of those early trees had some nice color," Donofrio said.